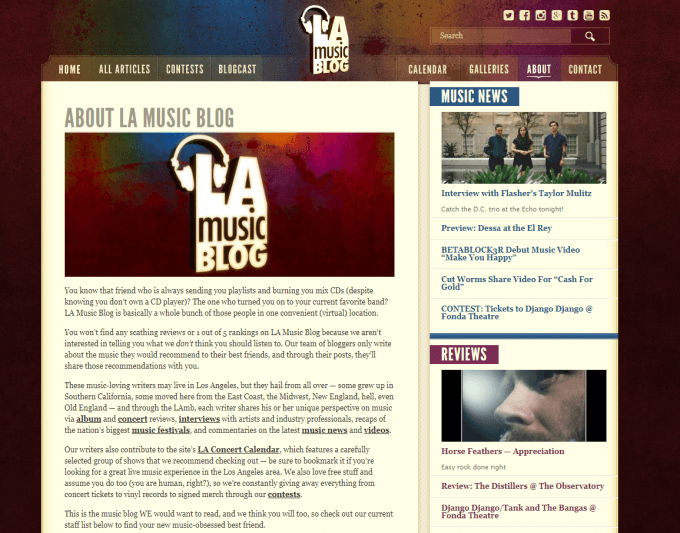 Looking for a great music blog to sink your time into? 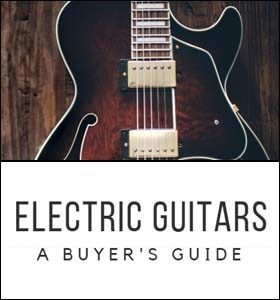 Can't seem to find something that scratches that musical itch? Well, you're in for a treat! 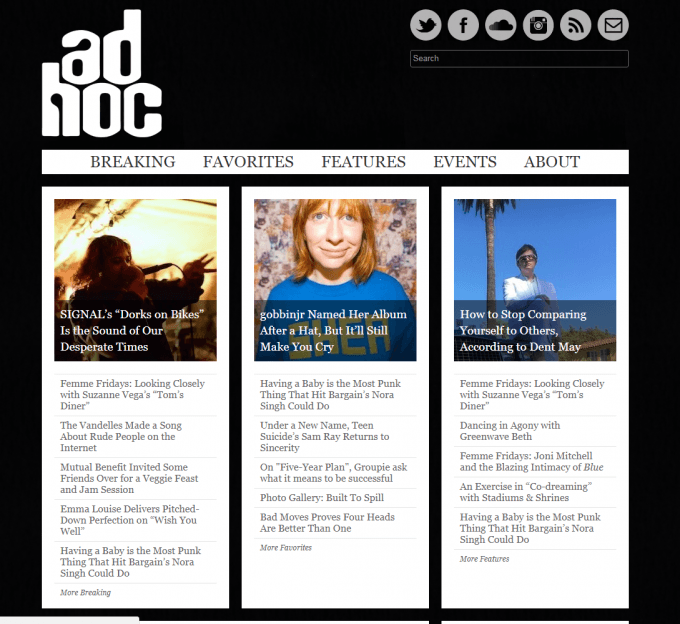 We've compiled a list of 27 "up-and-coming" music blogs, ranging from small to medium-sized audiences. We intentionally left out the big guys, because let's face it, we all know who they are and we've all read them at one time or another. 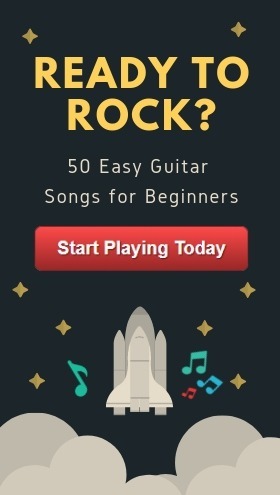 Whether it's classical, rap, or simple guitar songs you're after -- let's get started! 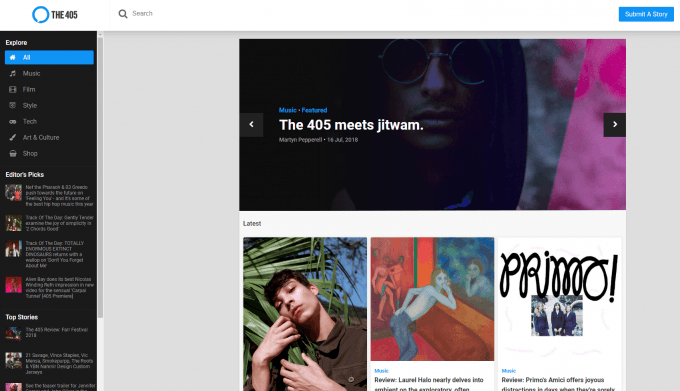 The music blog must be "up-and-coming", and have between 500 to 18,000 blog visits a month. As you'll notice, we aren't going to review the big guys because they've already got a huge readership and most of us know who they are. And, as you'll also notice, we did include some of the big guys! This was for completeness and ensuring we covered every popular music genre on our list. Nearly all of the blogs on this list are still small to medium-sized up and coming blogs, though. So, for the vast majority, we still took the "little guy" approach. All of the blogs you'll see here have between 500 and 18,000 blog visits a month. Remember, this is a rough estimate and isn't the number of visitors to their entire website, just the blog! But overall, they're all run by either independent authors or small-medium teams who publish content on a regular basis. 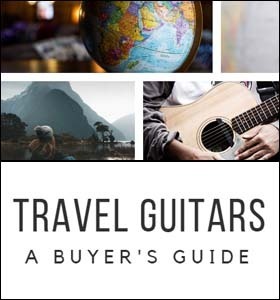 Enter your email below and I'll send you 50 Easy Guitar Songs you can start playing straight away! Please note: These aren't listed in any particular order. As far as we're concerned, these blogs are all superb and equally deserving of our "top blogs" medal! The original videos section! Nothing quite like it. Check it out here. Buzzing Daily. 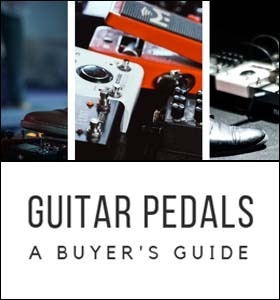 This is truly unique compared to the vast majority of music blogs out there. A one-of-a-kind playlist delivered day by day. They have great top songs compilations and even hosted events. The music release lists. Updated frequently - check them out here. 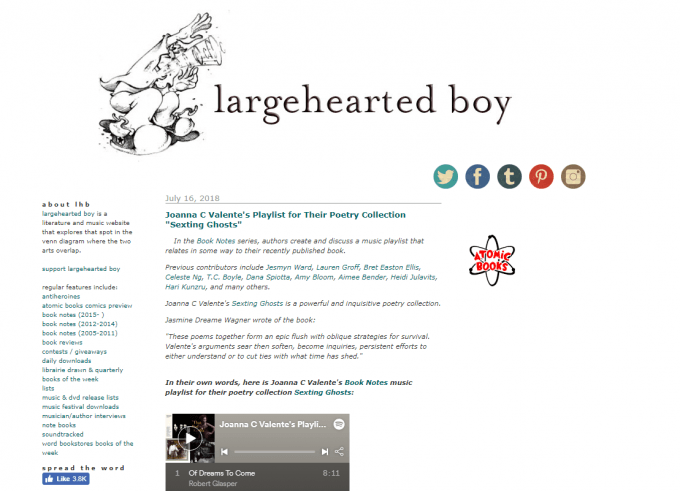 Combination of literature & music - this is a great, unique twist on your typical all-music blog. Their in-depth musician interviews! Here's an older one (yet still intriguing) with Phil Collen. Great top albums lists. With a fresh, unique perspective. Their in-depth, well written articles on new music pieces and/or genres. A great example is Journey to the NOLA swamps - Birth of Sludge Metal. They also have the occasional interview that's worth listening to. Awesome coverage of new music videos in the rap genre. When Jay5 released his new music video, they had it covered stat. Check it out here. Elevator Mag has the occasional interview as well, like this one with Adot from a while back. 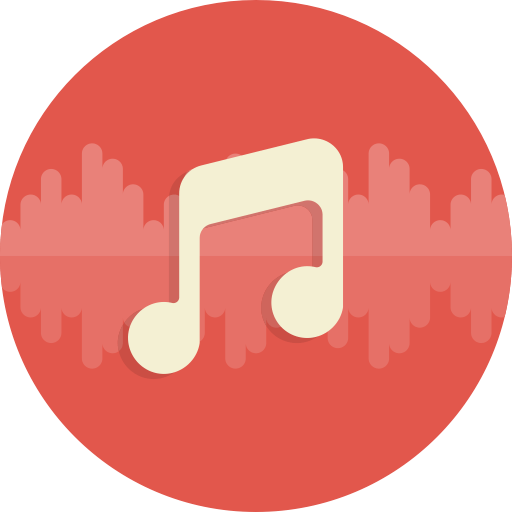 If you're interested in Hip Hop, R&B, and Rap and like to stay up to speed on the latest happenings, The Boom Box may be the next blog you should check out. They've got the latest, up to date stories on R&B. And the best part? They publish frequently, so there's always something to read up on. A recent post of theirs we just read through: Jermaine Dupri at the Songwriter's Hall of Fame. 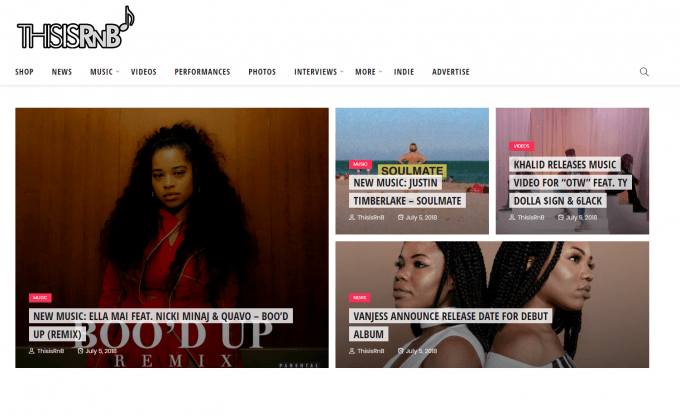 If you want the latest on R&B (and to read up on the newest music releases in the genre), this blog has it. Note: The Guardian is an established national newspaper. 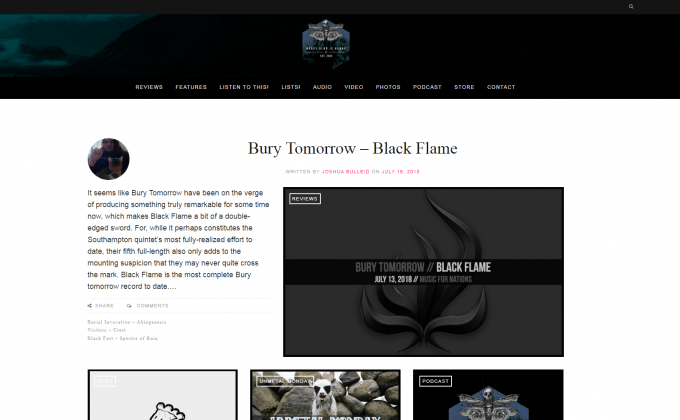 So why, then, did we include their music blog in an "up and coming" list? Primarily, for covering each genre in as much detail as we could. The Guardian's music blog fills in the gaps and ensures we've covered all our bases. The huge selection of great album previews and unique stories. For instance, they had an interesting "Debunking the One Hit Wonder" piece published recently, and another about The Carpenters. Even though these were published a while back, they're still getting readers and visits to date. Strong as ever. The variety! They've got some great "Music Favorites" and "Top Albums" lists to take a look at. And although not directly music-related, one of their most popular posts is John Fell Ryan's The Shining Analysis. 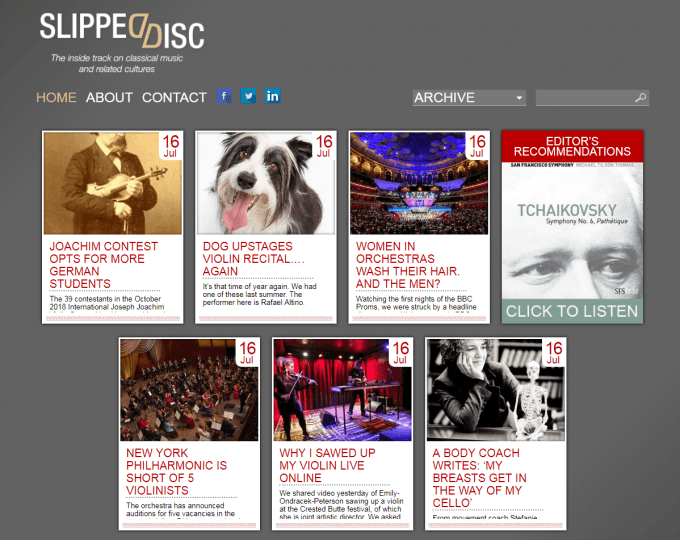 Note: Slippedisc.com is a widely read culture and news site written by Norman Lebrecht, with ~1.7 million readers every single month. We highly recommend you check out a few of his latest articles. Unique perspective on classical music, culture, & related stories. As an example, this is a very engaging article published several years ago: Alice Coote: An Open Letter to Opera Critics. 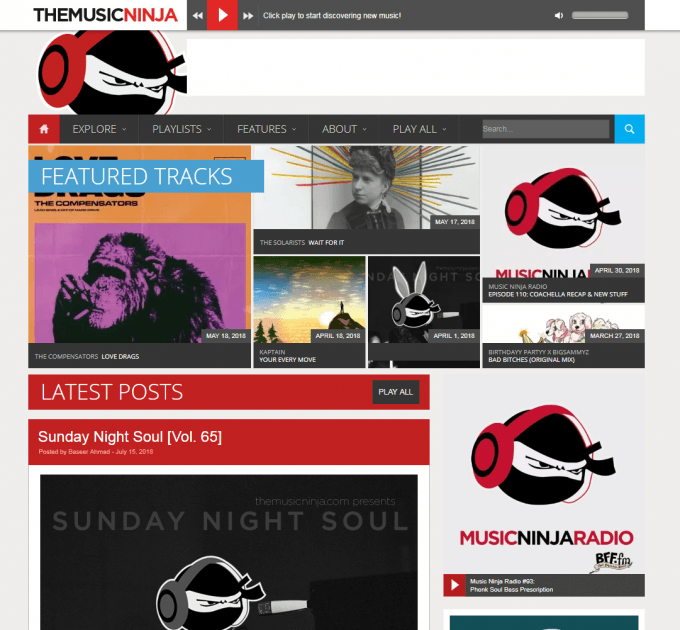 TMN (The Music Ninja) Premieres , and continuous new music release posts. When drake came out with his new song "How About Now", they had it covered. Same goes for J. Cole and his song Forbidden Fruit. These are just two examples of posts that were heavily sought after (and still get readers to date). 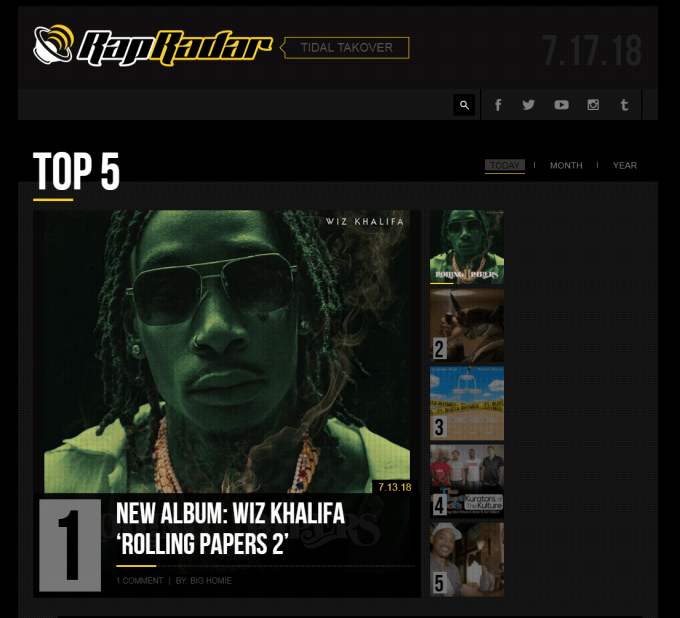 Up to date & trending news in the Hip Hop genre. 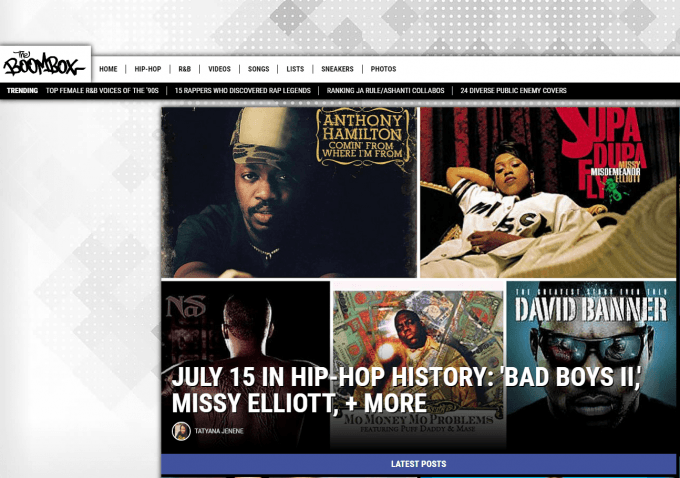 If you're looking for the latest stories, Hip Hop News (as its name suggests) delivers. 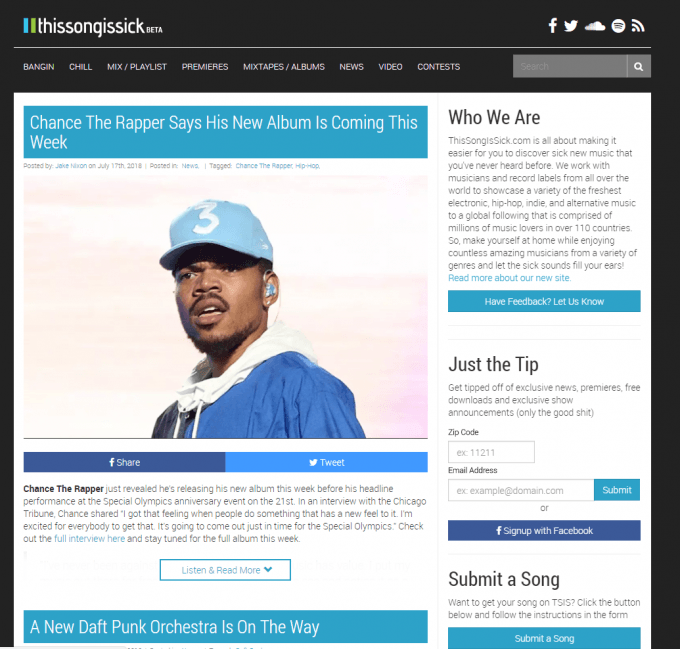 They post frequently as well, so this is a music news website you'll always have something to read on. Awesome resource for everything classical, with some intriguing list posts! 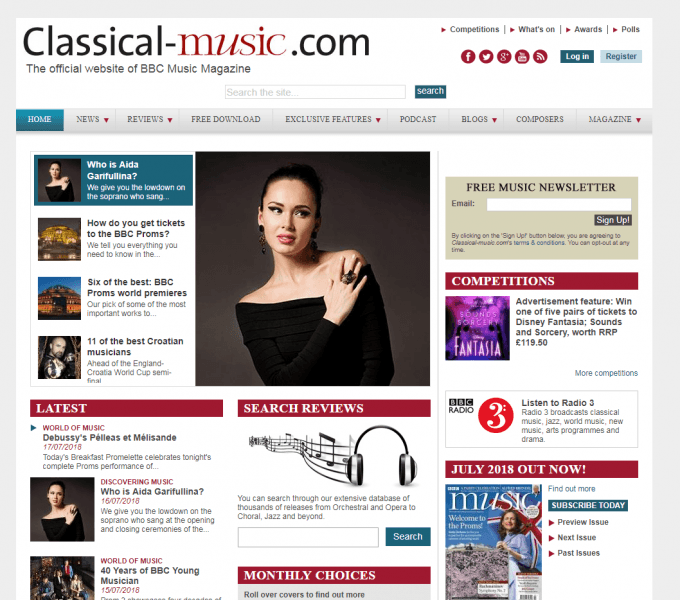 This is the official BBC Music Magazine website. Interested in the greatest violinists instead? They've got the top 20. Great songs, new music releases, and premieres. They've got it all. If you want to keep an eye on what's coming out in several genres, reading this blog is the way to go. 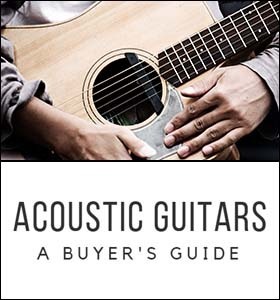 Their reviews of music and music-related gear. Everything from the newest song to a great pair of headphones. The variety on this blog is refreshing. 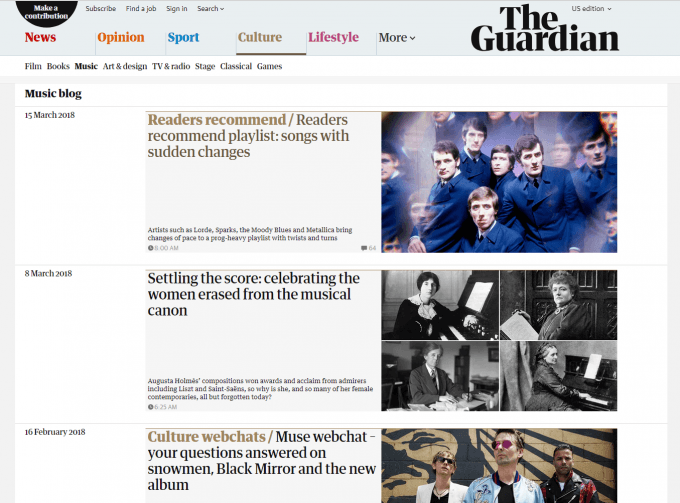 This article from a little while back shows you the best places to discover new music. And if you're on the lookout for upcoming album releases, there's a page on the blog dedicated to just that. The most comprehensive list of Metal Bands you'll ever come across! Check it out on the blog. 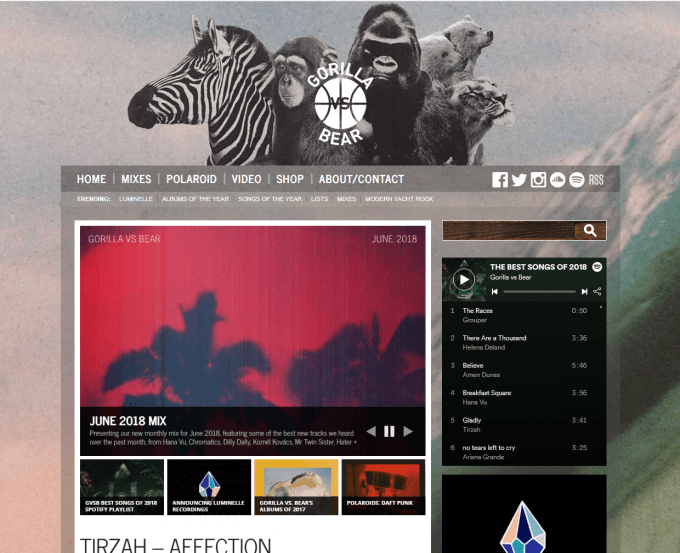 On top of that, they've got new album release reviews and a few interviews to listen to here and there. Awesome collection of rap news and the latest developments, coupled with interesting and unique twists on trending stories. There's always a good story to dig into and read about. 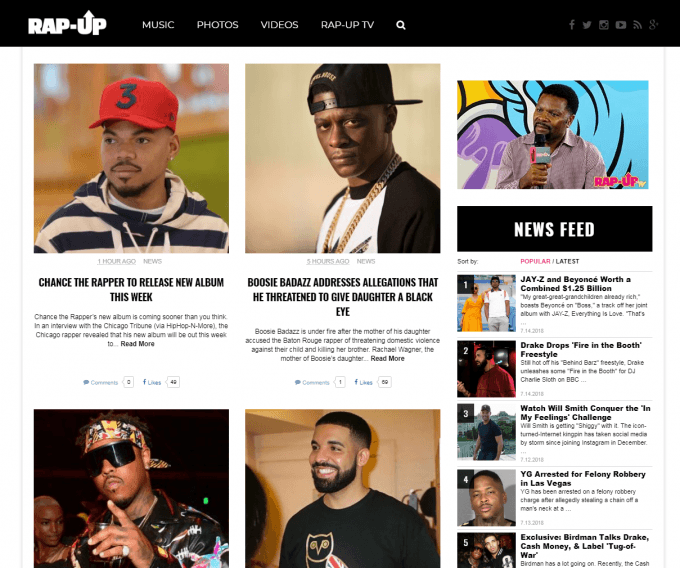 To stay up to date in the rap genre, look no further than the Rap Up Blog. Their podcasts, articles, and fresh news stories in Rap. Want to listen to Rap Radar's Podcast with Jay Z? They've got you covered. And if you're looking for new music, you can expect a post covering the latest album releases on a consistent basis. Interesting, useful facts about music! And of course, new music releases and news. That's right, you can read all about them on Fact Mag. In fact, here's a sneak peek: Looking for the best music making software? Best video game soundtracks? There's a good variety and "mix" of music news, facts, and albums to be on the lookout for. It's not one of those blogs where you're reading the same thing day in and day out, and although those blogs can be top notch, to us variety is always a good thing. 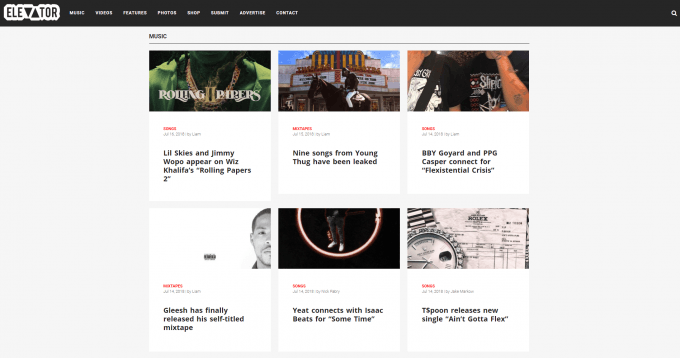 Exclusives with artists like Kendrick Lamar, News, and New Music. 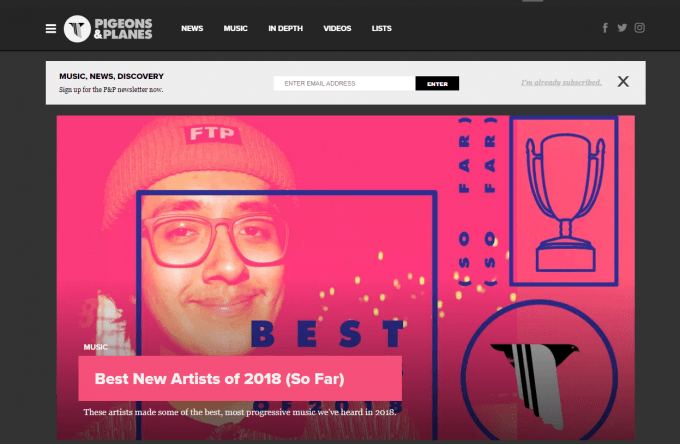 They've got a weekly roundup of new music to check out and listen to, so if you want a consistent stream of ideas, click the button above and give their blog a read. 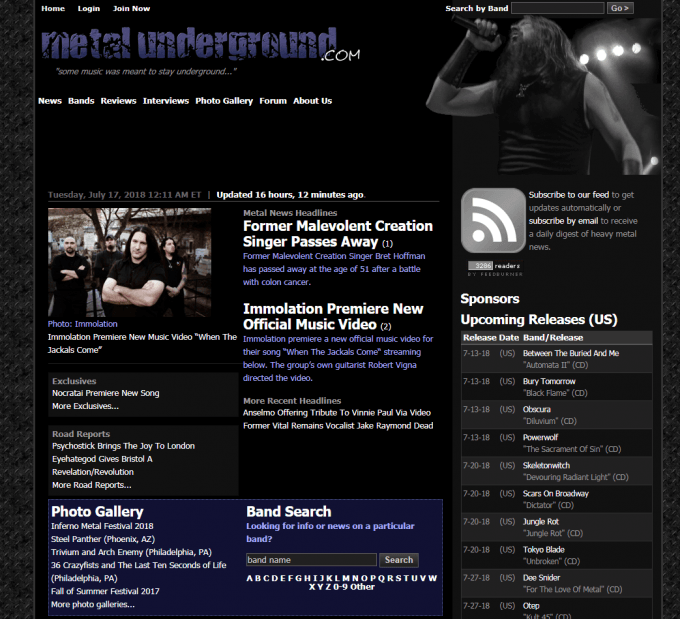 New metal album releases posted frequently on their homepage. Check it out here. Links to the Bandcamp page of each album (as available). The Indietronica Weekly Gems. 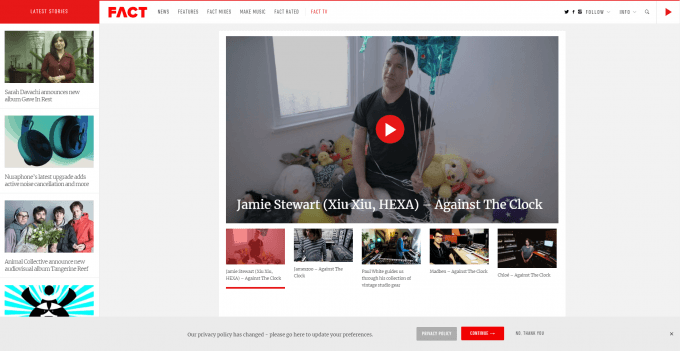 Every week, they have indie music recommendations for you to browse through and listen to at your leisure. 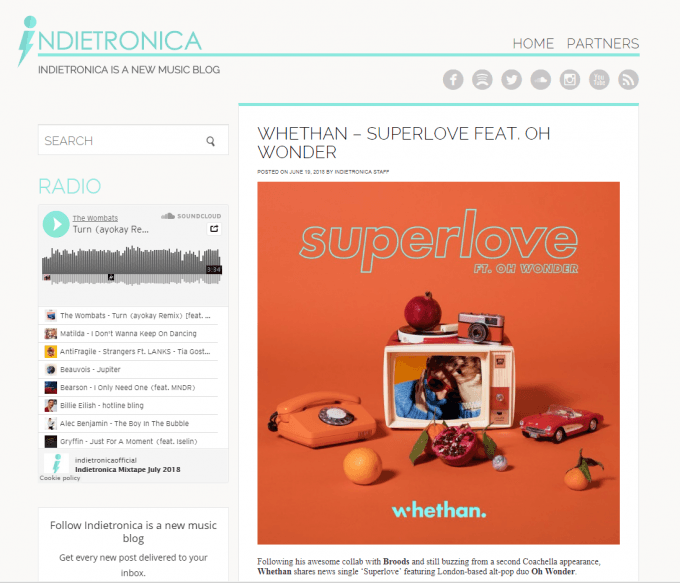 If you want to stay up to date on Indie Music and take in some of the newest releases, sticking around on Indietronica will do the trick. 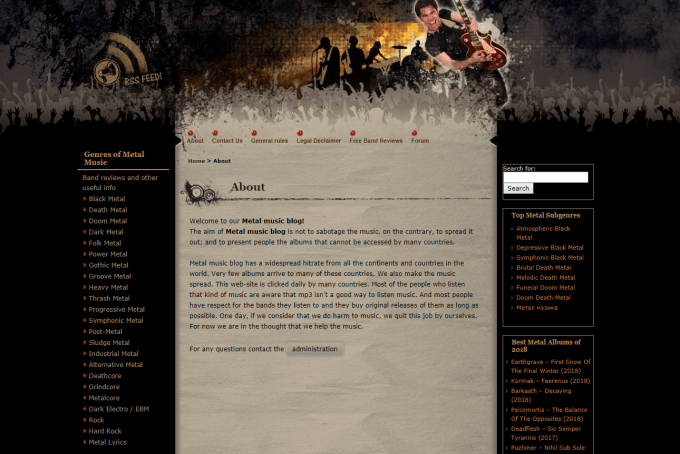 Drowned In Sound is an established music website based in the UK. Even though they're not an "up and coming" music blog, we felt that this list would be incomplete if we were to omit them. They review new records in incredible detail and focus on long-form content. 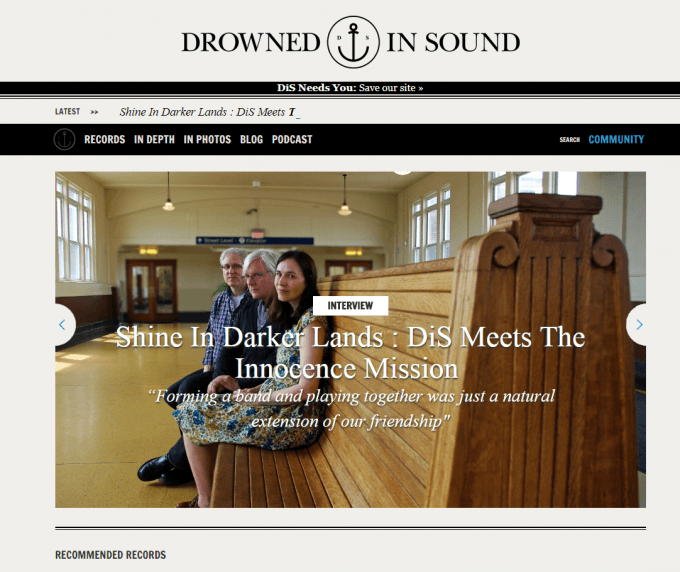 Compared to most music blogs that publish a quick "snippet" or paragraph without going into too much detail, Drowned in Sound takes it two steps further and thrives on writing about the details. A great example is when Fallout Boy came out with their new album Mania, Drowned in Sound was on top of it with an in-depth, long-form review. Same with Steve Wilson's new Album, To the Bone. We highly recommend you check them out. First and foremost, we're a fan of the Gorilla vs. Bear Theme. On top of that, we're fans of their monthly mixes. They post every few days (sometimes daily stretches of new music releases and reviews), which is perfect for new music discovery. They post super interesting stuff! That's reason enough, isn't it? And let's not forget... 10 New Indie Rock Bands. 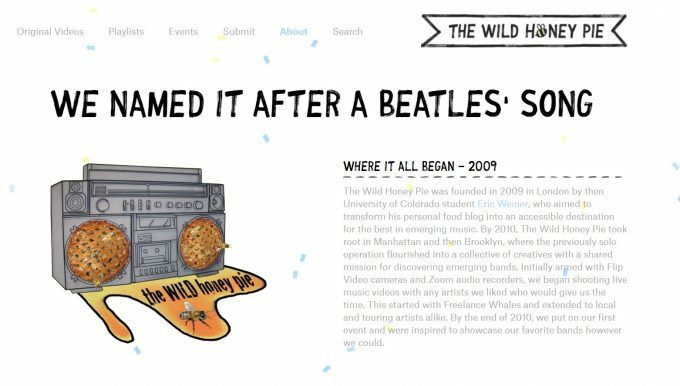 Reading this blog sure makes me curious and wanting to learn more..
Their original music section. 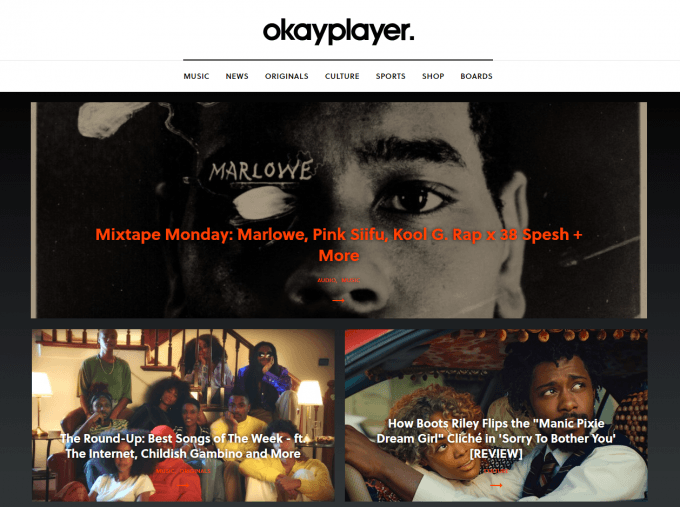 There's no better way to discover some brand new originals than browsing through Okay Player's collection. They get several submissions a week, so there'll always be a chance to hear something new. They've also got trending music news and a series of new album releases they cover. Overall, it's a great mix of content for music lovers. Their concert and live event coverage. They covered Coachella, they dialed in the lineup in the Firefly Music Festival. 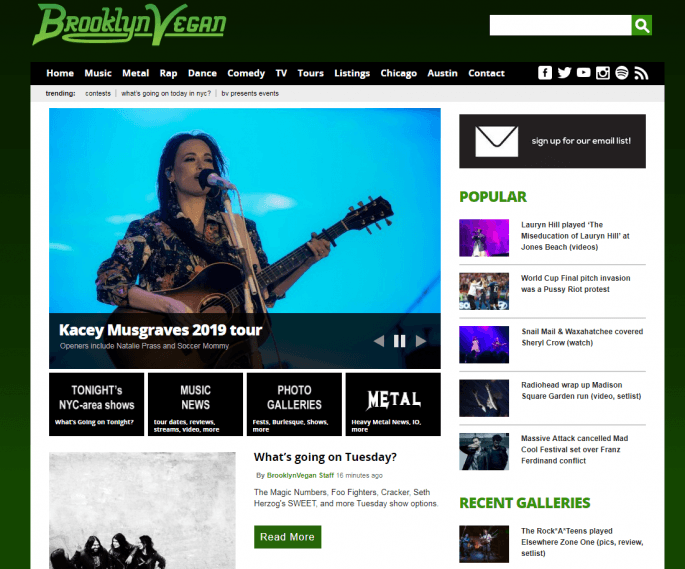 All in all, if you're looking for more live event coverage, concert news, and live music information, Brooklyn Vegan has you covered. 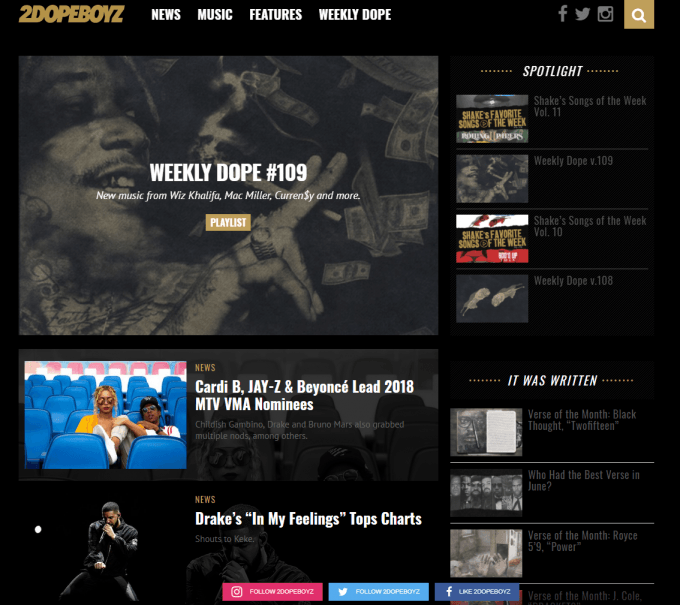 We just looked at some of the best small & medium-sized music blogs out there. They weren’t ranked in any particular order, because all of the ones on this list are already the best of the best. Now it’s up to you to browse through and start reading. Once you find a blog you love, you’ll keep coming back to it time and time again. Either way, thanks for joining us on this musical journey through blog-land -- we hope you find your people and a great fit, and I know that the owners of these blogs are super excited to have more of you reading their stuff.